For today’s entry, I thought I’d approach two books which share a lot in common and which can be useful to people who really enjoy candle magic. First up, there’s The Master Book of Candle Burning by Henri Gamache. This is a classic in many hoodoo circles, and falls into the same category of early 20th-century magical texts as the reprints of Black & White Magic by Marie Laveau and Mysteries of the Long Lost 8th, 9th, and 10th Books of Moses, also by Gamache. All of these small books (usually only around 100 pages each) contain lots of great information on their particular magical subjects, and all are the source of much debate regarding authorship (Marie Laveau most definitely did not write Black & White Magic, which is usually attributed to “N.D.P. Bivins,” whoever that might be). The book has its issues, of course. It makes heavy use of “black” versus “white” magic. It denounces the black magic as a “perversion” but then proceeds to provide numerous candle rituals for things like breaking up a couple or causing confusion. Still, if one can forgive it these foibles, it’s a great text to have on hand. 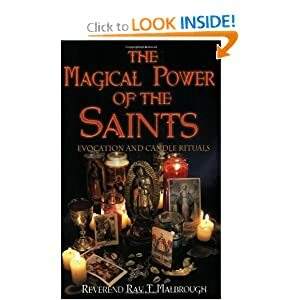 Similarly, The Magical Power of the Saints by Rev. Ray T. Malbrough proves itself a useful text full of practical candle burning rituals. There are many who do not like Malbrough, primarily because he blends hoodoo and Wicca in some of his books without letting the reader know which is which (his Charms, Spells, & Formulas is guilty of this, and apparently his Hoodoo Mysteries is even worse about it). However, most of the rootworkers who discuss him seem to offer at least some praise for Saints. Sometimes fear can be difficult to shake off when it gets hold of you. Then there are those people who get a thrill from putting fear and superstition in your mind. Controlling candle, dressed with Controlling oil. Write your name nine times. St. Dymphna candle, dressed with Peace oil. Write your name nine times. Guardian Angel candle, dressed with Peace oil. Write your name three times. As you can see, Malbrough is much more complicated than Gamache, and he definitely infuses his rootwork with some more Wiccan ideas (such as the “stones for courage” he mentions for the mojo hand, none of which show up in any of the African-American hoodoo sources I’ve found). So long as you can separate the wheat from the chaff, though, this is a pretty solid little book with good candle burning rituals. 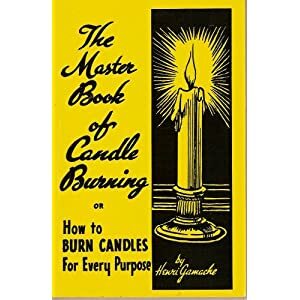 If you have this and Gamache’s Master Book of Candle Burning you will cover most of your bases as far as hoodoo candle magic goes, so I certainly recommend picking up both. If you can only do one, I’d start with Gamache and try Malbrough once you’ve gotten the hang of a few of these rituals, though (perhaps an Obtaining Money burning so you can afford to buy the book?). This entry was posted on August 6, 2010 at 9:30 am and is filed under Blog, Resources & Recommendations. You can subscribe via RSS 2.0 feed to this post's comments. I just wanted to say thanks to both of you guys for this blog/podcast combination. I’ve learned SO MUCH off of here. I am listening to older podcasts at night on my mp3 player before I go to bed. As a native of lower Alabama, I did not realize how rich, magically, the South was until just recently when I stumbled upon Papa Toad Bone’s site, and this one. It’s been an amazing journey the past couple of months that has literally changed EVERYTHING about this area I live in. Of course, I’ve always “felt” something creepy and ancient here in these parts…. Just never knew it was here to be found in the first place. Once again…. Thank you so much. P.S. I live right next to a pair of crossroads AND a cemetery! 😛 How cool is that, eh? First of all, I’m insanely jealous of your location! Being next to both a crossroads and a graveyard would probably result in me wandering off into the Otherworld never to be seen again. You’re very lucky! Secondly, thank you so very much for your wonderful compliments! I’m glad you’re feeling connected to the area around you, which is indeed rife with magic. There are so many magical practices in play in the South, and really all over North America (which is why we started this blog/podcast, of course). If they are of any use to you, that just makes me as happy as can be, because I really do hope that those of us who’ve grown up on this soil can connect with the traditions and land around us. Okay, lol. Off my soapbox now. Again, so many thanks for your fantastic praise, and feel free to comment any time and let us know how your exploration of local magic and lore is going!